At Drone Scotland, we recognise that most people still don’t really understand exactly what drones can deliver. As a consequence, we have set up Scotland’s first Corporate Demonstrations Programme*. The purpose of the corporate demonstrations are to provide organisations with a cost free method of learning and understanding exactly how drones can benefit their business. On the back of this, we know that we will generate more corporate relationships. It’s an everyday occurrence for us to explain how drones operate and outline the wide range of services that we can supply. It’s also evident that many companies are hesitant about purchasing a service that they don’t fully understand. Some business decision makers and influencers simply need that little bit extra reassurance that drones can positively impact their business. At Drone Scotland, we are taking a proactive approach to addressing these concerns and supporting this potential. Well, we will provide any company with an application form. Yes, there will be certain requirements that have to be met before we will provide a free demonstration. Like any commercial business, we will need to understand that they enquiry is genuine and that there is a potential for us to win business – straight forward and up front. We understand your general goals and we are very confident that we can supply you with a service that can positively benefit your company. We will contact you to arrange a demonstration of our services, at our location free of charge. The corporate demonstration will be based around your business requirements. We will not be looking for a decision on the day but will be looking for feedback. We understand your general goals but sadly, don’t believe that a drone service is quite right. We will provide either written or verbal feedback explaining why we don’t believe a drone operator is what your business needs. Yes, a drone service could benefit your company but the services you require are not currently provided by Drone Scotland. We will attempt to introduce you to another Drone Operator that may be better suited. More information required. We will have to hold a telephone conversation. The goal of that conversation is to progress your enquiry to one of the above outcomes. Your objective. What do you need a drone to deliver? What do you envisage the benefits of using a Drone would bring to your business/project? Have you ever used drones, for commercial work, before? If so, please provide more details. What locations/types of locations are you looking for the drone to operate at? Are you the decision maker? If not, what is the decision making process? Have you read our rates page thus understand the approximate costs for contracting Drone Scotland? What date would you start using Drones should you choose to proceed? We will have an informal chat followed by a brief demonstration. 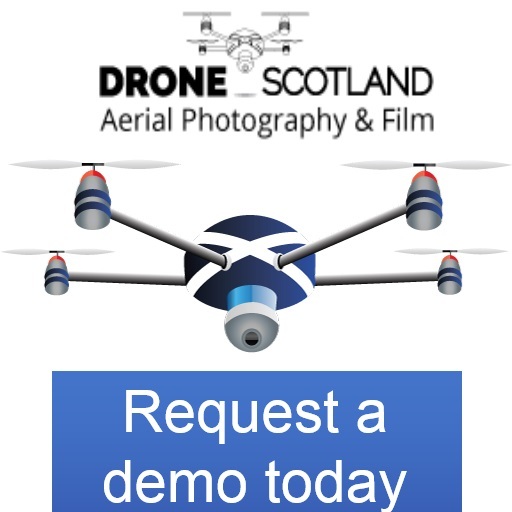 Once the drone has landed, we will be able to review the flight and discuss how Drone Scotland can potentially benefit your company. The preferred outcome for both parties is that we can help your company achieve it’s goals. However, that won’t always be the outcome. We are not sales people and we won’t be pushing, or applying pressure for a decision on the day. We do expect feedback on the day and would request that a decision to proceed or not will be provided within 7 calendar days of the demonstration. Q – I came along, thought the Drone was brilliant but need to get other colleagues to consent. Can my company get another corporate demonstration? A – Yes however, the fee will be £100 for 1 hour on our site. Q – I came along, thought the Drone was brilliant but need a 2nd demonstration on my site? A – Yes, of course. We will need to complete a full site and flight assessment as well as the other normal pre flight procedures. Our fee will be £150 for one hour on site plus travel costs where applicable. Q – We want the demonstration at our location? A – Yes of course. We will need to complete a full site and flight assessment as well as the other normal pre flight procedures. Our fee will be £150 for one hour on site plus travel costs where applicable. Q – I have to cancel. Can we reschedule? Q – Can I take away any footage of the day? Q – Why are you doing this for free? A – Our team has over 50 years experience in customer facing roles. We understand that there may be occasions where we help other companies test the water without a financial commitment. It makes perfect sense to us and we know it will to you too. *Scotland’s first Corporate Demonstrations Programme according to our research.